Book Reviews – The Rosie Project | C.H.A.M.P. Anyways, about the book. 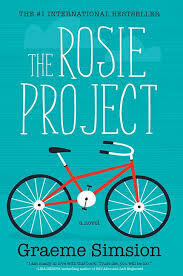 The Rosie Project is the story of a man who functions in a different manner than most. The book hints that he may have Aspberger’s but he is undiagnosed, but has many rituals and seems to feel emotions a bit differently as well as he has trouble conforming to some of society’s rules. When we find him, he decides it is time for him to find a mate and then he begins “The Wife Project”. He has a questionnaire to be completed and through this process he meets Rosie who he deems unsuitable for a mate but he decides to help with another project, the titular “Rosie Project”. It is at times a cute and fun book, but overall there is not much substance to it. It was interesting to read a story from a point of view of a person with a non-typical type of brain, but other than that, it was a pretty generic story.